It was a treat to spend a tasty afternoon in Tel Aviv with Natalie Levin, of the blog Oogio.net, who is a passionate baker. Upon meeting, one of the first things Natalie did was hand over a bag of homemade treats, which included a sack of these Tahini and Almond Cookies. Although I didn’t dive in right away (to be polite), after we visited the outdoor market, when I got back to my hotel, I opened the bag and found myself in love with the crumbly, buttery texture and the slightly exotic taste of smooth tahini (sesame paste) – which I’d never had in a cookie. There was also a bag of Sahlab Cookies, made from powdered orchid root, which were equally divine, as well as a few other goodies. These are simple little cookies that would go perfect alongside a fresh fruit salad or a bowl of sorbet, or during tea-time. I asked Natalie if she would share the Tahini and Almond Cookie recipe here on the site, which she was happy to do. There’s something exciting about baking. Combining all kinds of tastes and textures, putting it in the oven, and waiting for that moment when the scent draws you back into the kitchen – is probably why I love it so much. This is my true passion in life, and ever since I began baking professionally, it felt as if I found my destiny. Regardless of whatever is on the baking list for the week, fresh cookies are a must, as I always try to keep my cookie jar full of new tastes and ingredients. My friends and family just know that whenever they come for a visit there will always be something sweet next to their coffee, and they enjoy eating it almost as much as I enjoy baking it. Tahini is one of the most popular spreads in Israel. People here eat it with just about everything: inside their pitta bread, as a simple sauce for vegetable salad, as a falafel dip, and I’m pretty sure you would also find people who eat it with their cereals; the love for this spread is that intense. I have to admit that it took me years until I started liking tahini myself. My spouse is crazy about this smooth sesame spread, and his passion gradually broke my resistance. Nowadays, tahini is a regular member of our dinner. 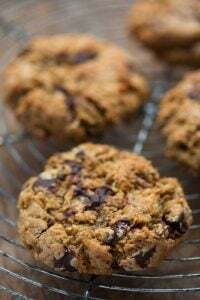 Having a sweet tooth, I also love using tahini in cookies and cakes, and that’s how I created these very easy and lovable Tahini and Almonds Cookies. 1. Preheat oven to 350ºF (175ºC) degrees. Line two baking sheets with parchment paper. 2. In a food processor, blend the all-purpose flour, whole wheat flour, ground almonds, butter, sugar, vanilla and salt, and process until the mixture looks crumbly. 4. 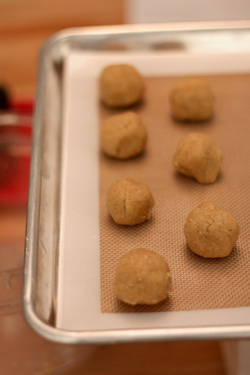 Create small balls of the dough, place them on the baking sheet, then flatten each one slightly with your fingers. 5. Bake for about 12-14 minutes, or until golden brown. Note: Ground almonds are also called almond meal, almond flour, or almond powder. They’re available at specialty markets, stores such as Trader Joe’s in the United States, and online. If you can’t find them, grind ¾ cup (70 g) of sliced blanched almonds in the food processor with the flours, until powdery. I am definitely making these. 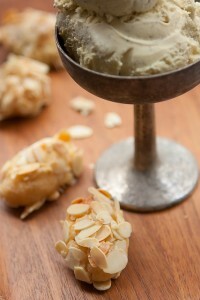 Almond and tahini, great combo, thank you Natalie and David. Kurma Dasa does a brilliant salad dressing with tahini and tamari. I have loved loved loved this series on Israel and determined to visit. Someone gave you a bag of deliciously unusual cookies and you waited? That shows impressive restraint. Greed trumps social etiquette in my book. There are also good brands of Arab thini which (I think) are produced in Israel but might be easier to get abroad, maybe, in Middle Eastern grocery stores. One is called “El Karawan” (their symbol is a bird), Elaraz (their symbol is a cerdar tree, and that is also the meaning of the name) and Eljamal (“the camel”, thini brands have a thing with animals, I guess). Most of them have simple, white, plastic containers in most pictures I’ve seen. These three are considered to be some of the best in Israel, too. With your recipe, I’m sure my cookie jar will always be empty. I am trying this on the weekend. Love it! Oh, those look so yummy! I have to try them :) Thank you so much for this amazing blog! Please explain the difference between raw tahini and read-made spread. I buy tahini in a sealed jar in the unrefrigerated section of the natural foods store, but it is to be refrigerated after opening. I always thought it was just “tahini,” raw I suppose, but now I am wondering. Oh gracious me. I just happen to have all of these ingredients in my kitchen right at this moment. I suppose work will have to wait. Thank you for this unusual cookie recipe. I use tahini in a delicious sauce for fish called “taratoor”. Crushed garlic, lemon juice and a bit of water is added to tahini to make a sauce with the consistency of thick cream. I love it on salmon.Have you ever heard of it? 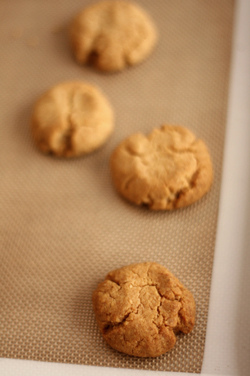 Tahini has become a staple ingredient in my home, and I can’t wait to make this cookie. I love sahlab, or salepi as we call it in Greece. You can make the most amazing ice cream with it. These cookies look so crumbly. What a texture. I will be making these soon. I enjoy tahini immensely. Thank you for the recipe, Natalie! And thank you David for introducing Natalie to us! Magda: I loved the Sahlab cookies as well, although it’s hard to find outside of certain countries. I linked to her recipe for folks who can find it, that want to give them a try, too. Or: Thanks for the tips on brands. Good tahini really does make a difference! Lori: Actually, I’m not sure what is tahini “spread” – perhaps it’s a product made with tahini, but not the pure thing? Maybe Natalie, or someone else, will pop in with the answer.. 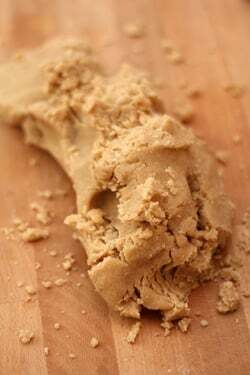 Raw tahini is a pure sesame paste (100% sesame seeds). Tahini spread is ready-made which may include spices and seasonings. For these cookies the pure tahini is what you’ll need. I just want you to know that I LOVE your blog. always. and being half Lebanese I grew up eating leban, lebane, tabouli, stuffed grape leaves, kefta, hummos, knafi…… so I’m loving reading about your trip and the foods of Israel. I love all those flavors, too. I am planning to go to Lebanon sometime in the next year (if I can find the time) because I’ve heard the food there is great, too. Someone showed me some pictures from the market there was I was bowled over by how beautiful all the foods were. I used to work with some colleagues who travelled to Israel quite often. One once returned with a box of cookies which she described as being made from sesame seeds, and I was instantly hooked – I possibly embarrassed myself by sneaking a few cookies whenever someone wasn’t watching. They probably knew it was me because they often brought back a box whenever they travelled there. If this recipe produces similar-tasting cookies, I will be forever grateful! I can’t wait to try them … plus, I’ve been trying to find ways to use up the large tub of tahini I have in the pantry. Fantastic taste. The tahini paste is so healthy and delicious. I am in luck – all ingredients are in place – I’ll be making these tonight while my apricot jam (from your site, David) – is simmering! 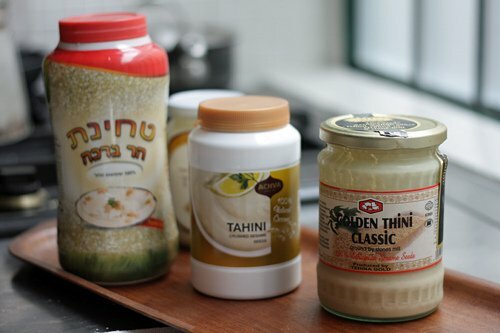 About tahini…went shopping for it the other day (first time). No Middle Eastern grocer close by but it turned up in the Jewish food section at our supermarket. Joyva Sesame Tahini – “Creamy Puree of Roasted Sesame Seeds” – manufactured in Brooklyn, NY! It’s in a tin with a reclosable plastic lid and says that, because it contains no emulsifiers or thickeners it may thicken. There was also another product in a plastic jar (by another manufacturer) that had a number of ingredients, so must have been the spread. Does anyone know anything about Joyva before I open this? Thank you! A note on the orchid powder in sahlab: the orchid powder is the dried tubular roots of orchid mascula. Most orchids are protected by CITES-accord. They cannot be picked in the wild but needs to come from fully cultivated plants. Please make sure that any plant you pick isn’t a protected species (under any law, regional or national). In my own country, Sweden, all wild orchids are protected by law. The test for the freshness of raw Tahini (and to make sure it is sweet and not bitter) is that the texture is homogene. If there is a brown almost solid layer at the bottom of the jar and a superior layer of oil – it means that the Tahini is not really fresh and you sould be careful and taste it before you use it. Some times the taste is still fine (even if there are 2 separate layers), and it can be used without fear, but the freshest Tahini has a homogenous texture and if of good quality – a nice and sweet taste. It’s in a tin with a reclosable plastic lid and says that, because it contains no emulsifiers or thickeners it may separate. Thank you David for getting this recipe and thank you Natalie for sharing it. David when you spoke of this tour and mentioned these cookies I was hoping you would be posting it. I think they sound sensational and look forward to making them. I stopped by Natalie’s blog and now will get her posts in my mailbox. It’s so much fun discovering new people with similar passions,through others that we follow. Thanks for this wonderful recipe! I just made them and they are absolutely delicious. I also tried the cardamom you suggested and added 1 Tbs of rose water instead of 1 of the Tbs of H2O. Then I rolled the cookies in sesame seeds before pressing and baking. YUM! Tahini is basically sesame seeds, so if we could incorporate nuts and seeds in breads and cookies, why not tahini? :) Thanks for sharing the recipe. I’ve a jar of tahini in my cabinet and would love to recreate this recipe! If it weren’t +33C where I am (Toronto) I would turn my oven on and make these. Next week when things cool down. Thanks for all these posts from Israel. Really enjoying them! 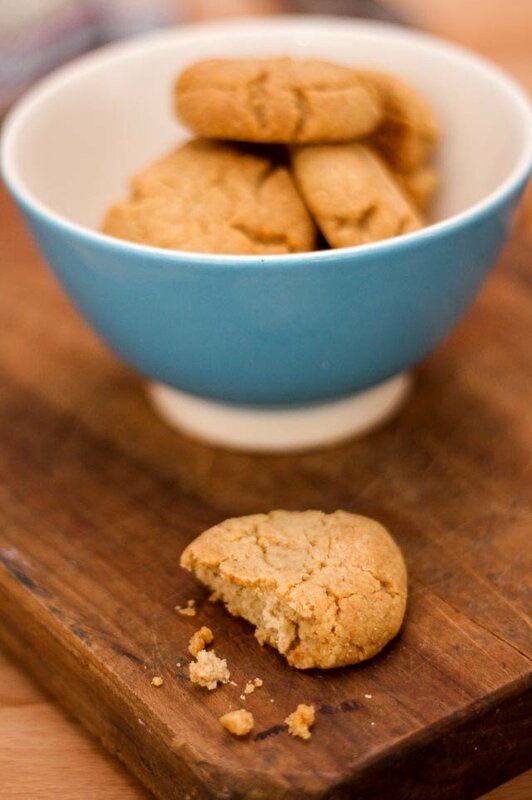 These look gorgeously yummy – a sophisticated step up from peanut butter cookies. I will try them soon. Regarding tahini….it is nearly unknown where I live (Poland), and if I do see it in the supermarket it comes in itty-bitty quantities. So, I hunted around on the www, and found that one can make one’s own tahini. I use a blender, raw sesame seeds, and sunflower oil. This may be blasphemy, but it works! I can produce a liter of tahini in a short time. I grind the sesame seeds in consecutive small batches and then once I have them all powdery, I put all of them in the blender and add the oil slowly until it’s all creamy smooth. I would hesitate to call the consistency “velvety”, but it’s darn close. I used to make peanut butter this way, but for the past couple of years homemade tahini has taken over, and I use it in dressings, hummus, on crackers, in sandwiches, and soon in cookies!! As always, David, thanks for the virtual trip. This time to Israel — where the food looks amazing. Thanks so much for posting this recipe! They sound so flavourful – I’m looking forward to trying them out! 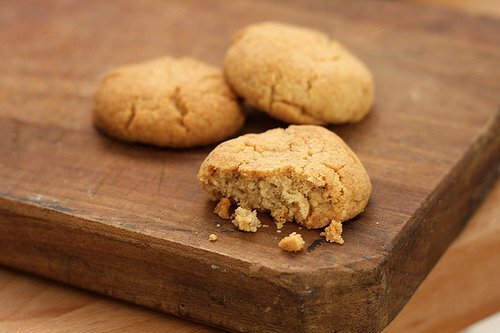 Baking can be so boring: you managed to add an unusual ingredient into a standard cookie: such a great, unexpected twist. For those of us who carefully watch our sugar intake due to allergies, do you think these could also be a savory treat and made without the sugar? They sound delicious! If so, I will try the recipe minus the sugar. I write an online guide for parents and would like to offer some sugar free snack recipes on it. It this one works, I would like to share it or link to your site. I have been following your blog for many years…thanks for the great writing!!! 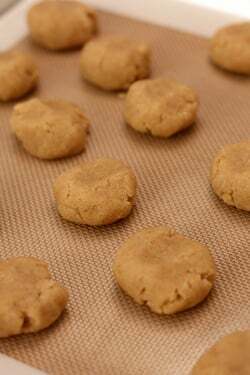 Great cookie recipe, I love the tahini-almond combination. (Tahini is one of my favorite foods, hands down.) For the rest of the tahini fans out there, I suggest taking a peak at Alice Medrich’s brilliant “Pure Desserts.” She tapped into unique flavor-combinations in that book, and has recipes for tahini cookies, ice cream, and cake (with toasted sesame oil). I’ve made them all, and they’re great (especially that cake). For a bit of a different tahini-type experience, you can try Chinese sesame paste. Israeli tahini is made from ground, raw sesame seeds. Chinese sesame paste is made from ground, roasted sesame seeds. They’re both brilliant, and should be a required food group! Donna: In baking, sugar isn’t just a sweetener but adds moisture and texture, so if you don’t use it, the results won’t be the same. You could try an alternative sweetener, but I don’t have a lot of experience with too many of them. CHN: That book (like all of Alice Medrich’s books) is pretty great. I know she likes sesame a lot. I’ve not seen Chinese sesame paste before, but will look for it next time I’m at the Asian market. Jennifer: Surprised you can’t find tahini – usually markets that specialize in Middle Eastern foods have it, but good that you can make it yourself! Now my coffee is lacking. I’m definitely trying this recipe out with some cinnamon. I absolutely love sesame seeds but have never bought tahini before (or almond flour/meal). Am going to make these cookies and then sprinkle seeds on top! Thanks for your blog which always brings fresh ideas. These look like they would be good rolled out with a rolling pin, like shortbreads. I might try that. I make my own tahini with toasted sesame seeds and a little sesame oil. Seeing Jennifer’s comment, I trust that this will work in this recipe. I do get my almond flour at Trader Joe’s, but have also made my own. My experience in grinding the almonds with the sugar (Nina’s comment), is that I have to be careful that it doesn’t wind up as the beginning of almond butter (or marzipan!) — I’ve had better luck grinding it with the flours for this kind of a recipe. Your mileage may be different. Elle: You could likely do that. 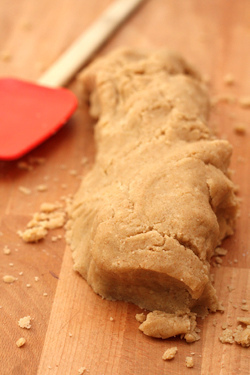 If the dough feels a bit dry, you could add a few drop of water, so it doesn’t crumble when you roll it, if necessary. Milt: I answered your question here. Thank you David and Nathalie for another option for baking with tahini! This recipe reminded me of the first time I made Dan Lepard’s tahini flapjack. It lends so much richness and flavour to the bar cookie. Will give this recipe a go soon! When this came up in my Facebook feed I and I clicked on the link, I was hoping that this would be a gluten free recipe. Could this be made with gluten free flour do you think? i’m using “Gold Tehini” (in the pic- is the one on the right). it’s important to make sure the tehini you are using is a whole-organic tehini. then you can be sure to get all the healthy ingredients!!! BTW, you may find “Gold Tehini” also abroad. Really enjoyed reading all of your articles on Israel. These cookies were also served to us and they were Delicious. Thanks for sharing the recipe. Since I just got back few months ago from Israel, it was wonderful reading about your trip. I too wrote a lengthy article about my food experience in Israel , we should share motes pn the same placed we went. Hopefully you will have time to read it. Zovsblog.com. Thank you again for the great picks. I’m pretty sure you could use gluten free flour instead of the flours in the recipe. I’m not familiar with the kind of GF flour you use, but in Israel we have a special flour made of a mixture of rice, tapioca. almond and potato mill, which can work pretty well in this recipe. If you have anything similar (or at least not an all starch-based flour) – this would be great for this recipe. The texture might get a bit different (and maybe even better and “melt in your mouth”). I recently found sesame seeds in bulk where I live and have been meaning to try making homemade tahini. Must try with these cookies — they sound wonderful! I love tahini cookies, i will try asap! Thanks David. This sounds so yummy! Quick question not related to your recent post. Just made the roasted banana ice cream from The Perfect Scoop and was wondering why the recipe uses whole milk and not cream. Also, this recipe seems to have less liquid ingredients than most of your other ice cream recipes. So sorry to bother you but I am trying out lots of your recipes with my new ice cream maker and this one seems a bit different than most. I am hoping I didn’t miss something! Why do we use unsalted butter but then also add salt in recipes ? I made a successful batch with just over 1/3c honey instead of sugar. I kept the other ingredients and their proportions all the same. Thanks for the Israel posts, I am smitten! Any other recipes would be very welcomed. @Nancy I can answer your question about the butter: sometimes salt is used to cover off-flavors in butter — if you start with unsalted butter you will be able to tell if it is fresh and sweet. Then you add salt to recipes so as not to get the flat taste caused by lack of salt. There may be other reasons, too, but that is the one I know. I like the sound of these tahini cookies with cardamom. I’m also wondering about using some honey for flavor along with the sugar. 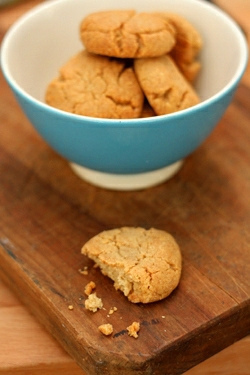 Am having a lot of fun recently with tahini, much appreciate the cookie recipe – and David, your whole blog, a delight. There’s a great Chinese salad dish that uses sesame paste – it should be the Chinese paste made from unhulled seeds, but you can cheat and use regular tahini. White cook a chicken, let it cool in its stock, bone it and hand-shred the flesh. (Give the skin to the dog for a treat.) Make a sauce with the sesame paste, chilli sauce or chilli oil, a bit of soy sauce, maybe some Chinese black vinegar. Fiddle till you like the taste and have enough. Fold the sauce into the (cold) chicken, garnish with finely sliced spring onion and/or cucumber. Can serve alone, or over cold rice vermicelli. Awesome bite size cookies! :) Haha. THanks for sharing your recipe. DDS – done dusted sorted – just made them and eaten them (have saved some for my wee ones and my french neighbours) absolutely delicious. Thanks. Love your website. Wait for it to come across my screen each week. As we show our Limoges dinnerware at Maison & Objet twice a year, I am always looking for exciting things to do and see in Paris. l turn to your website for fantastic and great ideas while visiting such a lovely and interesting city. These cookies were marvelous–I shared them with my co-workers and they are now looking forward to your website as well. Thanks for the extra enjoyment in my life. Have all my ingred. 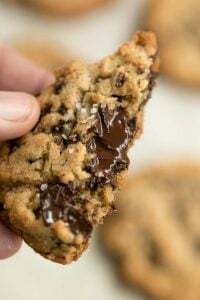 ready to make these yummy looking cookies but re reading the recipe..Is there a mistake with this recipe on the cups/oz to gram conversions, specifically the sugar and flours? If not, please lmk and I will follow the recipe as posted. Thanks! Sorry but now I’m confused. The recipe says “3/4 cup sugar (150 grams)” but your note says “1 1/2 cups sugar is 150 grams.” How much sugar should we be using? Again, sorry if I’m overlooking something obvious. I love a cookie with some nutrition to it…and this one is so handsome and cute and the ingredients are altogether appealing. I like the way you share others’ recipes. Totally enjoy your writing and recipes, too! I made these cookies today and they are not only incredibly delicious and addictive, but they taste just like the ones which my colleagues used to bring back from their holidays in Israel (if not better!). Many thanks to you and Natalie for sharing this great recipe. I am so happy to be able to make these cookies in my own home. I’m definitely going to try this. Nice to visit your site. David – love the Israel posts and guest posts. I have heard that the best tahini you can find in the US is Roland brand, made in Israel. Hope that helps some US folks! David, I have a can of opened roasted tahini paste sitting in my fridge. Do you think it would turn out good in this recipe? David, loved this whole series on Israel, a place I’m waiting to visit. And as usual I love your writing and look forward to your blog with eager anticipation. About these cookies, at the end of the recipe you suggest ways to “tinker”. I’m wondering if you have done some tinkering and if so what was you favorite addition. I’m a baker and love to try new things. BYW, good luck in your new home. Kitchen looks divine. These taste amazing with frappé, like halva in cookie form! Plus you could almost argue they are health food :) Will try them with honey instead of sugar next time.This series on Israel has been really inspiring. I made these last night – and promptly ate three straight away. A wonderful look at Israeli food as well. Angelia, I would love to know how you liked using the honey vs sugar. Did it alter the taste much? For better or worse? Am loving this series too. look really delicious. i’m greek and as all greek people love tahini. Thanks for these, David. I hunted for the recipe from your original post and couldn’t find them – they look fabulous. Techina (tehini) is one of my most loved foods. My favourite is Achva techina (the middle one in your picture) although there’s also a lovely Lebanese techina on the market by a brand called Clic. I find that north american versions of tehini/techina are much more bitter and prefer the Israeli or Lebanese varieties as they’re much creamier, sweeter and milder. Angelique – there’s no reason why you couldn’t bake these gluten free. I use a fabulous flour mix which is 2 parts (or 2 cups) brown rice flour, 2/3 part potato starch and 1/3 part tapioca starch. Makes great cakes, cookies and muffins. You can add xantham or guar gum if you like, but I find that cookies don’t always need it. I have made these cookies today and they are very, very tasty! We also use a lot of tahin in Turkey. I have a jar of tahini spread in my fridge that I used making hummus and I haven’t known what else to really do with it. Thanks for this recipe! These cookies look marvelous–healthy(ish) and delicious, and I can’t wait to try it. I tried to pin a photo to share this link with friends, but it did not allow me to pin any images of the cookie. Why is this? Thanks, David! Done. Long time fan, first time commenter. And you responded within minutes. Now I’m a fan squared. The combination of this cookie looks amazing – and it’s another good use of tahini. I’ll have to try baking this when I get back. If you get some time, you can also make goma purin (or sesame pudding) with the tahini. This is a cold sweet panna cotta/more jelly like dessert that’s Chinese/Japanese? If you can get the black tahini it looks more crazy. Sesame ice cream is also very nice as well. Any reason why i can’t pin this to pinterest? (You use pinterest yourself, so you must see the value.) I use pinterest as the primary way i keep track of recipes and blogs – why wouldn’t you want your readership to have an easy way to come back to your blog in the future? Woops, just noticed you answered the Pinterest questions just a view comments above mine. Never mind! Ok- just made them. So very YUM!!! They taste like halva cookies- what could be wrong with that!?! it also kinda gave me an idea to do a tahini and chickpea cookies (switch out the wholewheat and almond for 175g gram flour), which worked wonderfully XD. I hope u dont mine, its one of my ‘success’ cases so i posted it on my budding blog, but u r referenced! I live in Tel Aviv and these were much better than any Tehina cookie I’ve had here! Even the raw dough was yummy! I added a bar of chopped chocolate. I should like tahini, but I just cannot! My good friend from Israel visited me for some days and we were cooking together e.g.eggplants with tahini, but…;-) I like grilled eggplants with mozzarella, carlic, oil, basilica and tomatoes much, much more. But we are still very good friends! Brilliant recipe, I agree that it tastes like halvah. Woo, too sweet and kinda weird tasting for me! Swing and a miss on this one. Guess I’ll stick with good old peanut butter cookis. I don’t have a food processor so I used a pastry blender and elbow grease. The cookies turned out perfectly! They taste delicious and compelling–one that will never fade in my taste memory. I’m going to offer some to my yoga group. Thank you David!